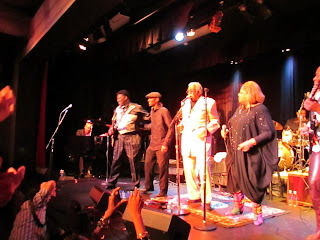 This past weekend, I attended a Blues concert at Villa Montalvo that brought Chicago Blues artists and local Silicon Valley musicians together. It was an evening in tribute to blues legends who have passed in the last year. JC Smith, on the west coast, pulled Eddie Shaw, Kenny "Big Eyes" Smith, and Vaan Shaw together from Chicago. See the connections! We all have them but don't always look for them. The connections between the musicians on stage, and their network that brought them together, is pretty amazing as you can see. They are able to get the right talent together anywhere in the world, and pretty darn quickly too. Picture below left to right standing: JC Smth, Kenny "Big Eyes' Smith, Eddie Show, Ladee Chico, Vaan Shaw.